Case in point: Trump’s announcement that a pardon for Manafort has not been ruled out. If matters were not so serious, one would think that current events involving Paul Manafort, Roger Stone, Jerome Corsi and Julian Assange are nothing but a bad redux of Watergate and the events of January 1973. The script has been updated but the tactics remain the same. In January 1973, the Watergate burglars faced the prospect of serving long prison terms for crimes involving the break-in of the Democratic National Committee headquarters. In 2018, alleged electronic burglars and their conspirators are staring down what appear to be virtual life sentences for hacking into the computers of the Democratic National Committee. There are important differences. In the case of Watergate, we had Americans committing crimes against other Americans. Today, the allegations are that Americans conspired with a foreign enemy to commit crimes against Americans. With Watergate, the burglars were unsuccessful in obtaining any damaging information against the Democrats. Richard Nixon on tape said, “It wasn’t a third-rate burglary; it was a third-rate attempted burglary.” In 2016, electronic burglars were successful—they did steal emails and those emails were used to great effect in influencing the outcome of a presidential election. Despite these differences, there are striking similarities. 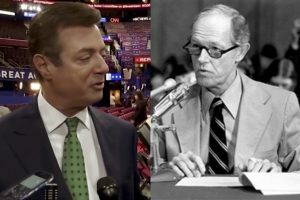 Paul Manafort is a modern-day Howard Hunt and Stone, Corsi and Assange are the Watergate burglars. Howard Hunt was a CIA operative who helped organize the disastrous Bay of Pigs invasion of Cuba in 1961 by recruiting Cuban exiles living in Miami. Some of those same men would become Hunt’s Watergate team in June 1972 working for the Committee to Re-Elect the President. When they were arrested during the bungled burglary, Hunt and his partner G. Gordon Liddy fled (they were in the attached Watergate hotel) but left behind incriminating evidence like Hunt’s check for country club dues and an address book with White House telephone numbers in it. Soon enough Hunt and Liddy were indicted, but by that time a major cover-up was underway. None of the burglars or their superiors were talking. The men in jail were being paid “hush money” to assure their silence and to cover attorney fees, family costs and bail money. After Nixon’s reelection in November 1972, Howard Hunt called Charles Colson, a Nixon advisor and lawyer, to complain that “the ready,” meaning the support money, was coming in “dribs and drabs” and that the whole matter could blow apart if somehow the burglars were forgotten by the White House after Nixon’s massive victory. Colson, eager to have Hunt acknowledge that he was not involved in the planning of the Watergate operation, secretly recorded Hunt on a White House dictabelt. Colson played the dictabelt recording for White House Counsel John Dean and Dean immediately knew they all had a problem. The payment of money to assure silence in the face of a criminal investigation, Dean concluded, constituted an obstruction of justice under federal law. Instead of blowing the whistle, as he himself had been a lynchpin of the cover-up, Dean did what most do facing certain loss—he doubled down. After meetings with Nixon’s top advisors, Haldeman and Ehrlichman, and Nixon’s former Attorney General, John Mitchell, the White House used leftover campaign money (called a “slush fund”) to keep the hush money flowing. But the noose began to tighten. The burglars’ trial was set for January 1973 before federal judge John Sirica. Sirica, a conservative Eisenhower appointee, had read enough in the Washington Post and elsewhere to be highly skeptical that the conspiracy to infiltrate the DNC stopped with Hunt and Liddy. He smelled, as he put it, a “whitewasher.” So he made sure the burglars and their lawyers knew that if a jury found them guilty, forty-year sentences could be expected. Hence, this is the same predicament faced by Manafort, Stone, Corsi and Assange. Corsi recently said on MSNBC that he fully expects to spend the rest of his life in prison. During December 1972 one event propelled matters such that the White House and Nixon had to surreptitiously intervene, further enmeshing them in obstructing justice. In a moment of the highest drama Howard Hunt’s wife, carrying $10,000 in fresh hundred dollar bills on a flight from Washington, DC, to Chicago, was killed when her plane crashed just outside Midway Airport. She had been the paymistress for the hush money. Hunt was devastated. He had young children and now they would be effectively orphaned if he spent decades in prison. Hunt again reached out to his friend Colson (they knew each other as Brown University alums). Through his lawyer, Bill Bittman, Hunt sought assurances that he would be pardoned if he remained silent and pled guilty to the break-in crimes. Colson met with President Nixon in the first week of January 1973 and microphones in the EOB office recorded the exchange. Nixon agreed that Hunt’s case was special given his wife’s sudden death and that he could expect his sentence to be commuted if he kept his mouth shut. There were lots of winks and nods. Colson met with Bittman, a former Department of Justice prosecutor who helped Bobby Kennedy nail Jimmy Hoffa. Colson told Bittman that “Christmas comes once a year.” Bittman understood the code. Hoffa had been pardoned by Nixon the day before Christmas a year earlier. Bittman had his answer. His client Hunt, who had said he would fight the charges against him, folded and plead guilty to the entire indictment. But what about the others? There is no evidence that Nixon offered pardons or commutations to the other burglars. But the Cuban exiles took the cue from Hunt that they, too, could expect executive clemency if they pled guilty, so they also threw in the towel. Liddy and wireman James McCord thought they could beat the prosecutors, so they continued the fight and went to trial, losing on the last day of January 1973. The question is whether this history is repeating itself. One logical explanation for Paul Manafort’s bizarre behavior is that he has a wink and nod, just like Howard Hunt did in 1973. We know Manafort’s lawyers have been communicating with the President Trump’s attorneys, just as Bill Bittman did with Charles Colson. 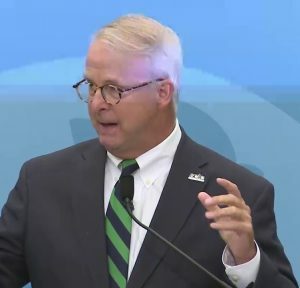 The defiant response of Stone and Corsi also seems to be the result of cues taken from the Manafort situation and President Trump’s encouraging tweets. If all this is true, these acts are just as much an obstruction of justice as the promises Nixon allowed to be given to Hunt in order to assure his silence. 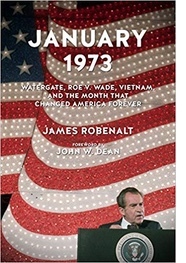 During John Dean’s “cancer on the presidency” talk with Nixon in late March 1973, when the wheels of the conspiracy were coming off, Nixon can be heard to agree with Dean that dangling pardons to assure silence “would be wrong, that’s for sure.” The use of the pardon power to interfere with a criminal investigation is an obstruction of justice and this abuse of presidential power became one of the articles of impeachment that eventually drove Nixon from office.